A beautiful blue and green gem material composed of azurite and malachite. 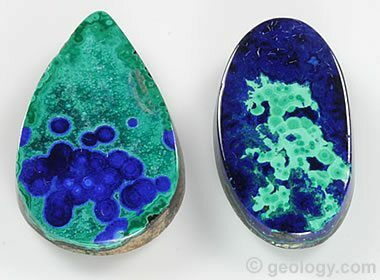 Azurmalachite cabochons: Cabochons of azurmalachite showing nice patterns of azurite (blue) and malachite (green). They were cut from material produced at the Morenci Mine in Arizona. These cabs were cut from thin vein material and have a natural wall-rock backing. Both cabs are about 25 millimeters tall. Azurmalachite is a blue and green gem material composed of two copper carbonate minerals, azurite (Cu3(CO3)2(OH)2) and malachite (Cu2(CO3)(OH)2). The name "azurmalachite" was derived by combining the names of the minerals. The material is also known as "bluebird." Azurmalachite can be a very attractive material that features bands, concentric patterns, and irregular mottling in vivid greens and blues. It has one of the most striking color patterns in the entire gemstone marketplace. Mottled azurmalachite: A cab showing a mottled mixture of azurite and malachite from an unknown locality. 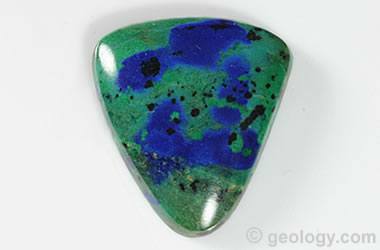 Azurite is often replaced by malachite as geochemical conditions change underground. This often results in a mottled appearance rather than distinct banding or other patterns. Azurmalachite is a rock that forms at shallow depths in the oxidizing zone above copper deposits. Slightly acidic, copper-bearing waters percolate downwards through fractures and pore spaces in the rock. During their descent they encounter a geochemical environment that allows the precipitation of carbonate minerals, and that is where the azurmalachite forms. The host rock is often a carbonate rock, such as limestone or marble. These neutralize the slightly acidic waters and facilitate precipitation of the dissolved copper in the form of carbonate minerals in fractures, cavities, and pore spaces. Azurmalachite is a relatively rare material. It forms where the local geochemical environment alternates between the conditions required to form azurite and those required to form malachite. A slice through a piece of azurmalachite reveals this geochemical history in its alternating bands of beautiful green and blue. Much of the azurmalachite that is sold today is mined in the southwestern United States, France, or Namibia. There are no mines developed just to produce azurmalachite; instead, azurmalachite is a byproduct of other mining activities. At shallow excavations, small amounts will be found associated with malachite, azurite, and other minerals. At some large copper mines, pockets of gem materials, such as malachite, azurite, or turquoise, are encountered while removing the rocks above the main ore body. At some of these mines, the operators will recover the gem materials; move a few truckloads of rock from that area to a dump where it can be prospected; or allow outside contractors to enter the mine, quickly remove potential material, and get out of the way as quickly as possible. Other mines focus on the main objective of mining copper, and thus an interruption to produce a pocket of gem materials is more of an expense than an opportunity. 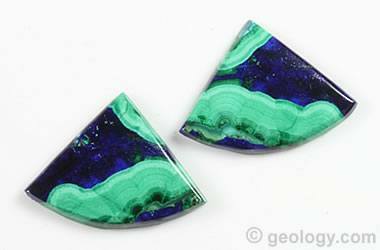 Banded azurmalachite: A pair of banded azurmalachite cabs that show the typical banding of green malachite and the voids between them filled with dark blue azurite. Azurmalachite is relatively easy to identify by observing a few properties: 1) azurite and malachite have spectacular green and blue colors that are seen in very few other minerals; 2) both minerals contain significant amounts of copper, which gives them a specific gravity (3.6 to 4.0) that is much higher than the average rock; 3) both minerals are very soft (3.5 to 4 on the Mohs hardness scale); 4) both minerals have perfect cleavage in one direction; and, 5) both minerals react with obvious effervescence in contact with dilute hydrochloric acid. Chemical Classification Sedimentary (a low-temperature chemical precipitate). Luster Rare crystals are vitreous to adamantine, fibrous specimens are silky, and massive specimens are dull to earthy. Cleavage Perfect in one direction, imperfect in a second direction. Diagnostic Properties Blue and green color, high specific gravity, reacts to cold hydrochloric acid with effervescence. Chemical Composition A mixture of azurite (Cu3(CO3)2(OH)2) and malachite (Cu2(CO3)(OH)2). Uses Cut into cabochons, beads, and ornamental objects. Azurmalachite is very beautiful and can thus be used to make spectacular jewelry and small ornamental items. It is a soft material that scratches easily. It also has perfect cleavage in one direction and lacks toughness. For these reasons, azurmalachite is best used in jewelry items, such as earrings, pins, and pendants, and other items that will receive very little impact or abrasion. It is a good idea to mount it in protective settings that surround the stone. Jewelry and unmounted stones should be stored in separate bags or separate compartments to avoid damage from abrasion. Unfortunately, azurmalachite does not make a good ring stone. It will quickly show abrasions if it is worn daily and can break from even a slight impact. For these same reasons, it is a poor choice for use in bracelets or for making beads. Some azurmalachite is treated to improve its durability. The material is porous and can be impregnated with resin. The resin hardens the surface of the stone and makes it less vulnerable to being scratched. Nice chunky pieces of azurmalachite rough can be slabbed for cabochon cutting. Slices cut through a piece of rough removed from the walls of a fracture can show the sequence of mineral bands that accumulated on the walls of the fracture. Cutting through a different orientation might yield orbs and lacy patterns. In many deposits, a lot of azurmalachite is in very thin fractures that are less than a centimeter wide. This material is carefully cut to yield small slabs that display solid azurmalachite on one side and a base of wall rock on the other. These slabs can be cut into cabochons that have a beautiful azurmalachite side for display and a wall rock side for stability. The cabochons in the image at the top of the page have natural wall-rock backings. Thin slabs of solid azurmalachite are sometimes used to produce "doublets." These are cabochons made by gluing a thin slab of azurmalachite to a thin piece of durable material, such as chalcedony or jade, and then cutting a cab with an azurmalachite top. This produces a beautiful cabochon that is more durable with a lower cost.